Last year saw a new festival come to Oxford. An October date and an indoor roster of venues spread across one day; a stellar line-up including the likes of Bastille, Lewis Watson, Jake Bugg, Liars, Lucy Rose, and a whole lot more, including some great local acts. So that was Gathering Festival 2012. Unfortunately I couldn’t make it last year, but I’m pretty keen for this year. At the moment, no acts have been announced, but an announcement is due to come in 2 days time. However, using my incredible investigative journalist skills (and spotting it on a certain band’s website), I know one act who will be playing at Gathering Festival this year – Local Natives. That’s enough for me to know I’m going, even before anything else gets announced. But either way, there’ll be an update to come once we get a few more names. In the meantime, have a listen below to one of the many standout tracks from Local Natives sophomore LP from last year, Hummingbird. Daft Punk’s fourth studio LP, Random Access Memories, seems to have evoked a level of fanaticism and nostalgia in a way that has come as a surprise. Their last release was the Tron Soundtrack, which was solid enough, and before that their third LP, Human After All, felt like a bit of a miss. So what’s changed? There are a few factors that we could try to tie it to. Firstly, the damn secrecy of the pair naturally creates an air of mysticism and intrigue. Second, the list-as-long-as-your-arm of collaborators. And not just any collaborators, but people who are the best at what they do. Nile Rogers and those disco guitar riffs. Pharrell, as a producer, is still one of the best. Chilly Gonzalez has a way of arranging and connecting music that’s too clever for my brain to process. And Panda Bear of Animal Collective – the man responsible for My Girls will always deserve our attention. Finally, coming back to that sense of nostalgia. Daft Punk’s first LP, Homework, has a special place in so many people’s hearts and minds. I’m currently reading Mike Skinner’s (of The Streets) book where he fawns over the record. It’s a brilliant record, mostly because of its underlying simplicity that is executed so well. On so many of the tracks, there’s one simple riff, one simple hook, and somehow they use it, twist it, and wrap an entire track around it. But for me, my introduction to Daft Punk came from their second EP, Discovery. It’s a warmer and more accessible listen than Homework, but just as full of the clever hooks that latch onto your cerebral cortex, with more of a storytelling aspect to the record. The sense of nostalgia has been key in the anticipation of the new record, as word came out that we should expect evolution, not revolution. The first cut we got was ‘Get Lucky’, a disco soaked beast that has at its core a Nile Rogers riff that you feel you could listen to on loop forever. 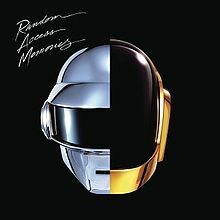 The most surprising thing about Random Access Memories as a whole is that ‘Get Lucky’ is the sunniest track. Another Pharrell/Nile Rogers track ‘Lose Yourself To Dance’ uses the same tricks as Get Lucky – with Daft Punk vocoded vocals in tow, but it feels a little tinged with sadness, despite its happy message. It repeats the Homework trick of having that one hook – the Nile Rogers riff – and wrapping all these other sounds around it to create something that is constantly morphing and changing into something else. Random Access Memories starts with another Nile Rogers collab, ‘Give Life Back To Music’, before dropping into a real downbeat moment, ‘The Game of Love’. It’s one of the few tracks where there are no collaborators listed, but Daft Punk seem to channel the spirit of their collaborators into it. Again, it’s another melancholy moment, but there’s such a distinctive groove to it. The bass line drives the track throughout as it bubbles slyly beneath the vocals. ‘Giorgio by Morodor’ pulls a trick that Daft Punk rarely break out. Opening with a spoken word narrative by Giorgio Morodor on how he chose to become a musician, it slowly builds, layer upon layer, to a frenetic finale. ‘Instant Crush’ featuring Julian Casablancas has hints of The Strokes during the verses with a typically New-York circa 2006 guitar sound. But once the chorus hits, again, it’s that bass line that lifts it to Daft Punk’s stratospheric level of ridiculous excellence. The journey up to track 8 – ‘Get Lucky’ – feels like a walk down a well-defined path. Everything is there as we expect it to be, gravel, choruses, signposts, bridges. After ‘Get Lucky’, we stumble off the path and fall into a ravine. A really fun, ridiculous, unexplored ravine. ‘Motherhood’ is full of bizarre crackles and noises, twinned with occasional orchestral arrangements. Ending on the monumentally euphoric ‘Contact’ featuring DJ Falcon, it can only be described as the soundtrack to Daft Punk taking off in their spaceship from planet Earth and returning to their home planet (France). After a record of generally mellow disco-grooves, it feels like a bit of a disingenuous move to leave on such a frisson of excitement. But what the hell, they are Daft Punk, why should they care? So it’s not quite the summer-jam album that many will have hoped for after hearing ‘Get Lucky’. But this is no bad thing. They weren’t going to make One More Time one more time. Perhaps it’s a record to put on just as the sun is setting, while the rain continues to pound your most enthusiastic of BBQ efforts. It’s that kinda vibe. It’s evolution, not revolution. By the magic of the internet, this post will hit the internet at, say, 1pm tomorrow. It’s more fitting than if I post it right now, on a rainy Thursday evening. This track that I’m about to ramble on about is full of all kinds of 80s sunshine. Granted, tomorrow we won’t be sunny, this is Spartaaaa England. And it won’t be the 80s, this isn’t New Zealand (sorry New Zealand, but you know it’s true). Anyway, here comes a Chvrches remix of a track by Ms Mr, whose debut album ‘Secondhand Rapture’ is out next Monday and is currently streaming on The Guardian site. But I adore this remix. The original track leads off the album, and is a little more dark and echoey. But Chvrches have gone and shot some kind of electro-sun-synth gun at it, turning it into something really quite brilliant. The chorus power-keys conjures an image of some 80s/Breakfast Club film resolution soundtrack for me. Who knows. And that long electro beat that flips about at the start of most of the 4/4’s. Tchhhhhh. Anyway, it’s nice to see Chvrches put this kind of spin on a record, as it widens the expanse for what their debut LP could sound like. Well, I didn’t see this day coming. Mariah Carey, on my blog. Bit weird really. But it’s valid. I haven’t had my password stolen by a 35 year old housewife from Milwaukee (I’ve just decided that’s her target demographic. Very specific). Anyway, the real reason that she’s here is that Miguel is here. Oh Miguel. His 2nd album from last year, Kaleidoscope Dreams, still gets an unyielding amount of plays from me. It’s been a little bit of a slow-burner in terms of success too, so it’s always nice to see an artist come through the other end and get the respect that they deserve. Since then, Miguel has turned up to a do a few guest spots here and there. He’s on J. Cole’s track Power Trip which is pretty damn swell, and now this track with Mariah has emerged. The first thing to dislike instantly is the hashtag before the track name. This is not a cool thing to do. As soon as Will.I.Am did this, it instantly became a terrible thing to do. I mean, it would be a horrible thing to do anyway, but he’s like the Catholic Church of the music business. He really can’t do anything right in most people’s eyes, and with good reason. So I should probably talk about the track itself at some point. First up, we barely even hear Mariah until 1:30. Bonus. Incredible. Keeping her insane-o warbling vocals off that much of a track is surely something worth knighting Miguel for. I don’t care if he’s American, let’s make him an honourary Brit. So I’m pretty happy that 0:00-1:30 is basically a new Miguel track – it’s a pretty straight-forward hook, with an ambling guitar fuzz winding its way low in the mix. And then Mariah comes in, and, for the most part, keeps that bombastic bonkers stuff on the sideline (apart from one minor slip), but, it’s actually quite a fun moment. Then Mariah and Miguel sing together, and the thing just works. It’s not going to change the world, it’s not going to save the planet from a meteor, but, it’s really, quite, ok. There you go Mariah, have that one for your scrapbook.